A central challenge for a strong cyber defense is the appropriate communication of cyber information. There are many key stakeholders that make decisions and convey information up to different levels of authority, and this information may not always be in sync. Additionally, cyber analysts know and often utilize technical jargon to pass along information, and these analysts can spend significant time and effort to building their own visualizations manually, such as network summaries, patterns, and recent attacks. To aid communication, we have developed a working prototype of a cyber dashboard which visualizes a simplified view of a network, particularly the key external players which are extracted from both IDS alerts and reports from a traffic analyst. 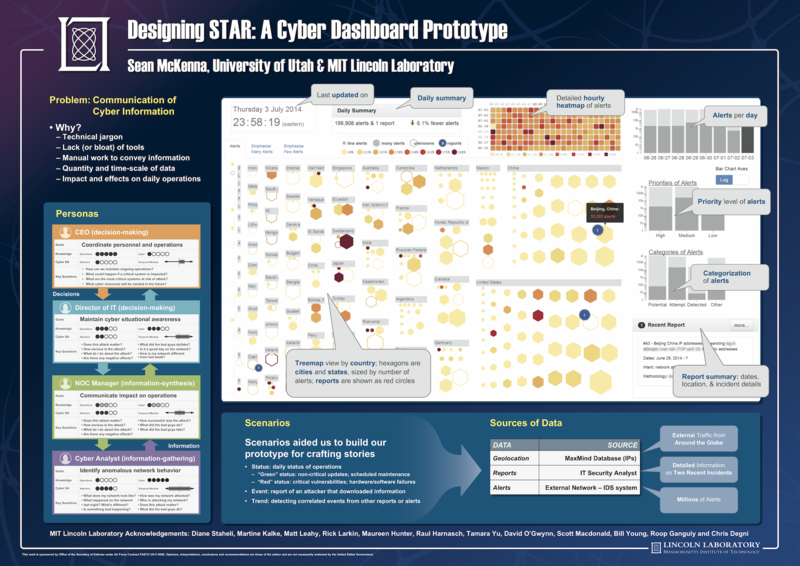 This prototype is one step towards enabling analysts to simplify and encode information into a visualization that can help tell the story of a cyber attack or a network’s current defense status. Proceedings of the 11th International Symposium on Visualization for Cyber Security - Posters (VIS ’14), 2014.